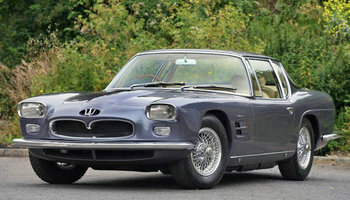 Of all the Maserati 5000GTs, Allemano bodied cars represent the largest proportion – some 22 of the 34 examples built. They were the production version of the car; built for royalty, the rich and the famous. Carrozzeria Allemano (established 1928, discontinued 1965) was an automobile coachbuilder in Turin, Italy, owned by Serafino Allemano. Initially, the fledgling body dedicated to mechanical repairs, so as to offer a more varied. The success is not late to arrive, a great success if you look at the dark economic period in which was about to enter the world because of the great depression of 1929. In 1935, however, Serafino Allemano decided to direct its efforts solely in the field of bodywork. But few years later, the outbreak of the Second World War forced him to suspend their activities, checomunque shots at the end of the conflict, first zoppicando, and then rapidly increasingly supported. Already in the late 40's, no less than newly commissioned Ferrari to a Allemano its interpretation on a Ferrari 166, made inter alia in collaboration with John Michelotti. In the early 50's are frequent its interpretations based Fiat and Lancia. For example remain famous in his 1100 coupe versions and cabriolet, carried out in 1954, and the beautiful Lancia Aurelia cabriolet. These cars, though produced in very limited print run, riscossero a remarkable success both at customers both at the same Car Allemano that relied to their cars. These successes Italians made sure that Allemano was noticed abroad. It was thus that in 1952, the same year of working dell'Aurelia cabriolet, the bodywork Allemano also devoted himself to Panhard Dyna 750 Coupé, a small car produced by competing in only 6 copies. In France, Renault Allemano entrusted with the task of creating a cabriolet version dapprime of 4CV and then the Dauphine. The name of Allemano became known in the UK, where the coach Turin found committed for him by the brands as Jaguar and Aston Martin. In 1954 Maserati was in conferring on Allemano a task, to build a fuoriserie based A6G 2000(see photo). Subsequently, the Casa Modena commissioned other works relating to Allemano, which stemmed authentic masterpieces such as those made on a 3000 GT and 5000 GT. The fame of Allemano even crossed the borders of Europe, and around the world, reaching even in Japan, where the coach receives a Turin committed by a small Japanese company for the construction of two prototypes. The two years between 1959 and 1961 were the happiest period for bodywork Turin, which produced two valuable interpretations of Fiat 1500, in coupe and cabriolet version (see photo), presented among others at the Salone di Torino . In the early'60s the company moved into a new home, always in Turin, but in Cossa (until then was located by Botanical Gardens). At that time he received from the small house Italian ATS the task of designing a new and unprecedented sports car road. From this was born the ATS 2500 GT, but not ebeb very successful, because now the commercial hegemony of Ferrari and Maserati in this area had already become steel. Finally, following the commercial crisis of the early'60s, the body closed its doors. The historic importance of the Outer Allemano was nonetheless significant because, along with other talented coach builders (Pininfarina, Bertone, Vignale, Ghia, Savio, Michelotti, etc..) Contributed to the city of Turin one of the world capital of design automobile. Allemano made various cars based on their own designs, and in some cases, externally made designs, such as those by Michelotti. Some of the earlier cars were Ferrari 166S (1948), Alfa Romeo 2500 (1950) and Lancia Aurelia (1952). The Cisitalia 202 Berlinetta (#105, 1951) was designed by Carrozzeria Scaglietti. For Fiat Allemano created three Fiat 1100 TV (by Michelotti, 1954), Fiat 600 (1955-1958), a few Abarth 750, Fiat 850 and Fiat 2200. For Maserati it made 21 Maserati A6G 2000/54, prototype designs for Maserati 3500 (1957), and 22 Maserati 5000 (1959-1965), many of these designed by Michelotti. There was also a Jaguar XK140, an Aston Martin DB2/4 (1953) a Panhard Dyna, as well as Renault Dauphine specials.